Book 2 of the Casey Duncan / Rockton stories. Did I start at book 1? Silly question!! Just in case I didn’t get around to mentioning it – as you can see by the picture I attached, this is an audiobook! 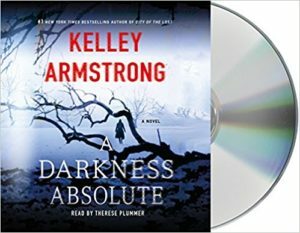 This is one of those audiobooks where I don’t want to get out of the car when I get home, because I want to keep listening. I’m glad my car has this “anti-asphyxiation” feature (I named it that just now) where you can turn the car off (say if you’re sitting in your garage), but the radio / CD player keeps playing for about 10 minutes. That way, you can safely and semi-warmly listen to your audiobooks in the garage without accidentally asphyxiating!! Go Nissan! Anyway… I liked this book a lot. Of course since I got it from my library, it’s the middle of a series. I swear that every random book that I pick up from the library is book two or three in a series. It never says that on the cover though! Thankfully, this book stayed in the middle of “you didn’t read the first book, let me meticulously rehash everything from the first book” and “of course you read the first book, we shall never provide any background details”, which was great. There were little details peppered throughout this book that explained important stuff from the first book, but not so much that the first book is ruined for me. I shall be reading it next. It’s sitting on my kitchen table right now. Of course my library didn’t have that one in audiobook form. I really don’t know how they choose their audiobooks. I guess someone bought just the second one and donated it? Whatever, not important. Share the post "Book 2 of the Casey Duncan / Rockton stories. Did I start at book 1? Silly question!!" I’m glad to hear that you enjoyed Book 2 because you reminded me that I started this series and forgot to look for the next book.